It is important to catch leaks and breaks in your pipes before they turn into a huge issue. With the help of the Gladiator Repipe team, you can learn the sign of impending pipe problems and have them dealt with fast. If you are experiencing any of these problems, then pick up that phone and give the Watsonville repipe team at Gladiator Repipe a call. As most homes in the Watsonville area are older and use outdated materials, It isn’t easy to complete a total copper pipe replacement in Watsonville. Old homes such as those in Watsonville make it difficult to reach important connectors and pipes as they are usually installed in hard to reach areas, such as crawl spaces and/or between walls. In order to reach many of the pipes and connectors, we must remove sections of drywall or paneling, and after the new devices are installed, we will replace these materials. At Gladiator Repipe, we have knowledgeable plumbers who know how to complete the job in a small building in only a few days. A larger commercial building such as a medical facility or factory may require several weeks of work to replace the pipes, but we can complete this type of job in steps by dividing the building into different sections. This allows our team to complete a repiping as fast and efficiently as possible. We have repipe specialists in Watsonville who are ready to begin working right away in a residential or commercial property. Our plumbing company knows that a copper repipe in Watsonville is required right away so that a customer has clean and safe water. We have access to the highest quality plumbing materials so that we can use the same types of pipes and connectors throughout a building. Call Our Watsonville Copper Repipe Plumbers Today! When our Watsonville copper repipe plumbers arrive at your property, we make sure that our customers receive a written estimate for the services. 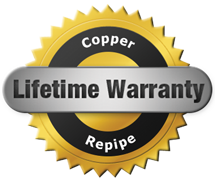 Contact the qualified copper repiping team in Watsonville, today at 408-465-0025. Ask for an estimate or schedule an appointment today.